I first made this appetizer for a party with 15 dietitian friends because it was gluten free and dairy free and many of my guests had food allergies. It was a hit at the original party, so I made it again for a friend’s co-ed baby shower. Once more, people loved it. Now, I’m sharing it with you for everyone to enjoy. Instead of using toasted bread for the bruschetta, you roast the potato rounds and that is your base for the toppings. Besides the classic tomato bruschetta, you can also top the potatoes with other combinations like blue cheese and bacon or avocado, tomatoes, and parmesan cheese. Basically, whatever topping your heart desires will most likely taste good on the potatoes. 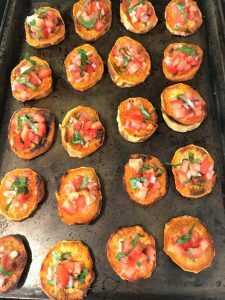 Enjoy this fabulous recipe for Sweet Potato Bruschetta. I first made this appetizer for a party with 15 dietitian friends because it was gluten free and dairy free and many of my guests had food allergies. It was a hit at the original party, so I made it again for a friend’s co-ed baby shower. Once more, people loved it. Now, I’m sharing it with you for everyone to enjoy. Instead of using toasted bread for the bruschetta, you roast the potato rounds and that is your base for the toppings. 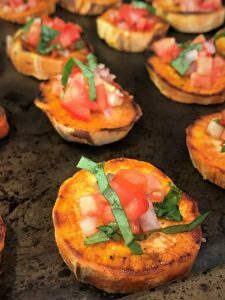 Besides the classic tomato bruschetta, you can also top the potatoes with other combinations like blue cheese and bacon or avocado, tomatoes, and parmesan cheese. Basically, whatever topping your heart desires will most likely taste good on the potatoes. 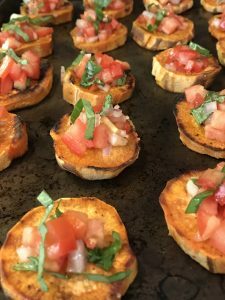 Enjoy this fabulous recipe for Sweet Potato Bruschetta. Preheat the oven to 450°. 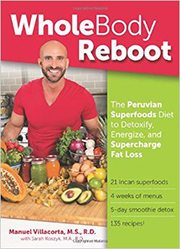 Scrub the sweet potatoes. Slice into 1-inch thick rounds – like coins. Spray a baking tray with cooking spray. Lay the potatoes on the baking tray and spray them with the cooking oil. Sprinkle with salt and pepper. 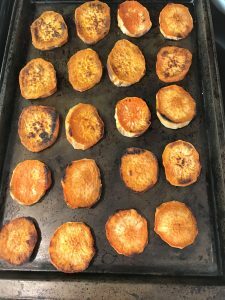 Roast the potatoes for 15 minutes. Flip the potatoes onto the other side. Spray with cooking spray and roast for another 10 minutes. Meanwhile, dice the tomatoes. Finely dice the shallot. Chop the basil. In a large bowl, combine the tomatoes, shallot, basil, salt and pepper to taste. Drizzle with olive oil and vinegar to taste. This is your bruschetta topping. When the potatoes are done, remove from the oven. 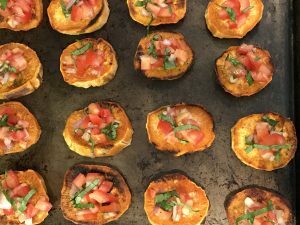 Top each potato with the bruschetta topping and serve. I like to drizzle a little extra balsamic vinegar and sprinkle a little salt over the top of the bruschetta for extra flavor.